Nikhil Lakshman, who was in Tehran last week, measures the Iranian State's responses to terror. A couple of days before Prime Minister Manmohan Singh had what he described was a "philosophical discussion" with Iran's Supreme Leader Ayatollah Ali Khamenei, Foreign Secretary Ranjan Mathai quizzed his Iranian counterpart Deputy Foreign Minister Hossein Amir-Abdollahian about the February 13 blast in Delhi in which an Israeli diplomat's wife was injured. The Delhi police had accused Iran's Revolutionary Guards of masterminding the attack, in which a man on a motorcycle placed a magnetic bomb on the Israeli vehicle. When Mathai raised the issue with Amir-Abdollahian, the Iranian responded that the bombing was "an attempt to defame us by our enemies," according to an official acquainted with the discussion. The Iranian official promised Mathai all cooperation in finding out who was behind the crime. Amir-Abdollahian added that "our people have been killed too" and insisted that there would be no problem in assisting the Indian government locate the individuals associated with the bombing. The Delhi police named four men in its chargesheet on the bombing which occurred close to the prime minister's home in one of the most secure areas of the capital -- Houshang Afshar Irani, who is said to be a builder from Tehran and is suspected of placing the bomb; Sedaghatzadeh Masoud, said to be a salesman in Tehran and is believed to be the mastermind behind the near-simultaneous bombings that occurred in Thiblsi, Georgia, Delhi and the abortive attacks in Bangkok the next day; Mohamad Reza Abolghasemi, said to be a clerk in Tehran's water authority; and Syed Mohammad Ahmad Kazmi, an Indian journalist who is charged with assisting the Iranians. An Iranian woman, Leila Rohani, is said to have assisted the alleged conspirators. When a two-member Delhi police team -- Deputy Commissioner of Police (Special Cell) Sanjeev Yadav and Inspector Hriday Bhushan -- visited Tehran for three days in August -- after much tro-and-froing between the ministries of home and external affairs and the Iranian authorities -- they were, The Times of India reported, fobbed off by Iranian security officials who said the accused's Iranian passports may be fake and that they could not locate Irani, Masoud or Abolghasemi at the addresses mentioned by the Delhi police. The Iranians's seemingly lackadaisical approach to the bombing in Delhi could not be more sharply contrasted by their position on the mysterious assassinations of three of their nuclear scientists allegedly by agents of the Israeli secret service, Mossad. 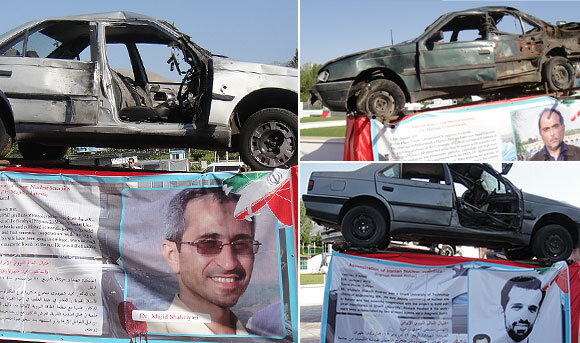 Aware that they would have the world's press corps in attendance for the Non Aligned Movement summit in Tehran on Thursday, August 30, the Iranians strategically stationed the bombed out cars in which Majid Shahriari, Masoud Ali Mohammadi and Mostafa Ahmadi Roshan were killed outside the media centre (Please see photographs above). Outside the media hall was an exhibition dedicated to terrorism directed against the Islamic Republic by the 'Zionist regime' and presumably the United States (one prominent hoarding leading to the NAM summit had the late Ayatollah Khomeini proclaim 'All Terrorism stems from the White House'). Shahriari, Mohammadi and Roshan worked at Iran's hush-hush nuclear programme which has led the United States and Europe to impose stringent sanctions on Tehran, especially its oil industry, from July 1 until Iran agrees to open up its nuclear facilities to International Atomic Energy Agency inspections and halts the enrichment of uranium to weapons grade quality. Israel's Prime Minister Binyamin Netanyuhu and Defence Minister Ehud Barak have repeatedly threatened to bomb Iranian nuclear facilities and scuttle its future threat to the Jewish State. Covertly, Mossad and other unidentified agencies may have crippled the Iranian nuclear programme by secretly spreading the Stunext computer virus through its systems a few years ago. Iran has blamed Mossad for the assassinations of the three nuclear scientists, and brandished confessions from individuals who it alleged were trained in Israel to assist the murders. 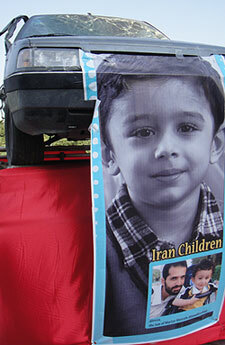 Left: A photograph of a slain scientist's orphaned son below the car in which his father was murdered. Inside the visitors's gallery at the NAM convention centre on Thursday, overlooking the leaders of the non-aligned world as they declaimed their responses to the challenges confronting their nations and humanity, were Shahriari, Mohammadi and Roshan's families with portraits of the slain scientists. Mothers and wives in black chadors, clearly in grief; one little girl restless in her seat, wondering what she was doing there.